Making The Most Of Every Day | It's In The Sauce! How often do we fast forward in our thinking, worrying about how soon a wonderful day or week will pass? I am having that experience now. For the past 15 years my husband and I have been going to St. Maarten/St. Martin in the Caribbean for two weeks. It is a wonderful vacation, filled with great food, shopping and relaxation. Most years we have family or friends join us for some of the time. 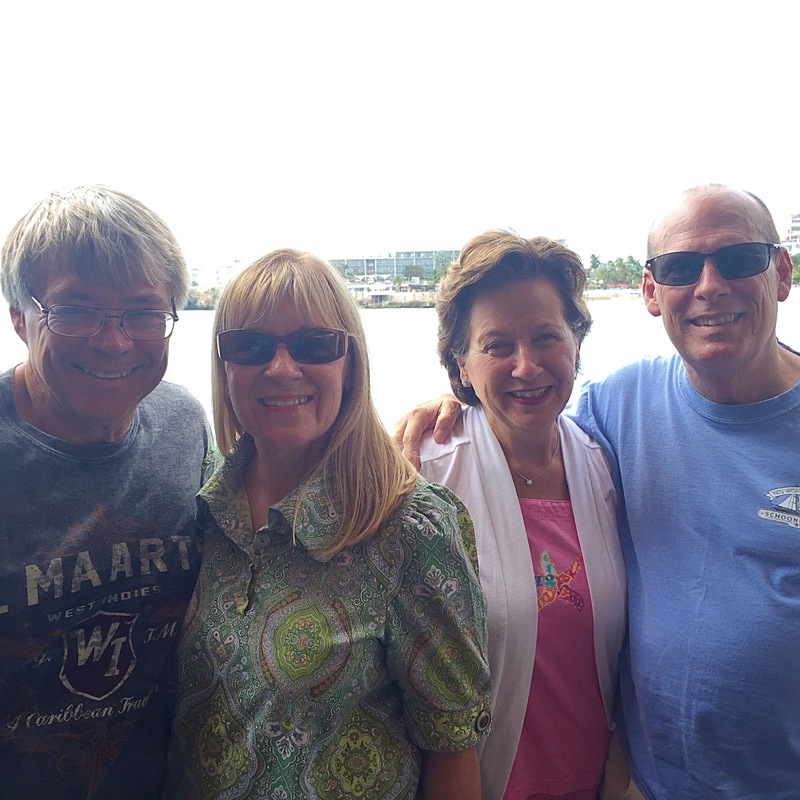 This year we were joined the first week by our good friends Pam and Butch from Alabama. They came for four days, and tropical storm Erika gave them an additional two days, and us that additional time with them. I am writing this as these two weeks come to an end. Mike and I will be going home soon. I am usually ready to go home when the time comes, and I am this year as well. I do, however, usually fast forward in my thinking and wonder what the next year will bring. I am more aware this year than previous years that health and other challenges can interfere with our plans. Last year at this time I was very healthy and twelve pounds lighter. I exercise walked many days, and was able to do anything physical that I chose to. Soon after arriving home from this two-week vacation last September I developed bursitis in both hips, a condition that’s still with me. I give the bursitis most of the credit for the weight gain, and all of the credit for the pain that has precluded me from exercising. And these two are related. I can’t help but wonder what this next year will bring. And I am well aware that it could be worse than bursitis. I have always been healthy, healthier than I probably deserve. Although now with the bursitis I may have a little bit of an “excuse” to not exercise much, I could have taken better care of my body all along, including eating better and exercising consistently. But I can’t change what I should have done before now; I can only decide what I will do now. One thing I want to do is focus on the present, letting go of the past, and not worrying about the future. Easier to write about than to do, but I plan to do my best to live in the present. The present is a gift, regardless of whether it is exactly the gift we want. Even with our aches and pains, we are alive, and some whom we loved aren’t. I am saddened by that thought, and humbled by the gift of life that I still have. Yes, I read the obituaries, and count! I hope that I am not the only one who reads the ages and counts. You know what I mean. And we also know how useless the counting is. Age is no determinant of longevity, although I suppose it is true that the older we are the more our days may be numbered. And it is also true that the older we are, the faster time goes. And dwelling on that does nothing to change it. So, it seems to make sense to make the most of every day, whether the days are in St. Maarten, or home doing laundry. We are heading into the busiest time of the year, and could feel overwhelmed by all of the holidays that will soon be upon us. Instead, what if we take each day as it comes, and rejoice in it? If we remain in the present each day, making it the best it can be, we will be more centered and grounded. The peace and calm that will come from that one decision may be all that we need to enjoy the present, which is, after all, the only time we really have. Let’s enjoy each day. Thanks for the reminder to appreciate each day that we are given! I am so sorry that you have faced the health challenges, but you have handled it well with grace. The memories we made with you guys will be a joy to revisit often! Hugs!